Originally, I was planning on exploring a general history of athletics at Dickinson College, not limited to a sport or time period, however, this seemed absurd. I decided to focus my research down to the formative period between 1919 and 1941, essentially the interwar period. I chose this time frame to limit the scope of my paper, as well as because athletics was changing and developing during these two decades at Dickinson, and throughout the United States. The NCAA was established in 1905, and was still functioned as a voluntary organization through the 1920s. This was one example of how organizations began to institute rules and regulations regarding athletics on a national level. Dickinson’s faculty and administrators created the Athletic Association, which existed before 1934, and then reorganized it into the Athletic Board of Control, which began managing the budget, hiring of coaches, creation of schedules and such duties. Throughout the period I am studying, there are many correspondences, speeches, articles in the Dickinsonian and a couple history books that discuss the issues of subsidization of athletes and athletic programs, and how that may corrupt the pure spirit of amateur sport. In addition, the records in the archives show how concerned the administrators are with their image as an academic institution and continually emphasize the primary role of education over athletics in College life. However, they do recognize the importance of athletics as part of a student’s education. In addition, the fact that athletics helps attract students to enroll in Dickinson, and helps encourage alumni donations or involvement in the school, the College admin. and faculty are careful to not promote athletics too much. My digging in the archives has resulted in these interesting findings and I intend to explore the Athletic Board of Control’s meeting minutes now that I have recently found. It took research and time to narrow down my topic, but it has resulted in a more focused and valuable project because of it. Below is a photo from “Eye on the Game” website through the archives. 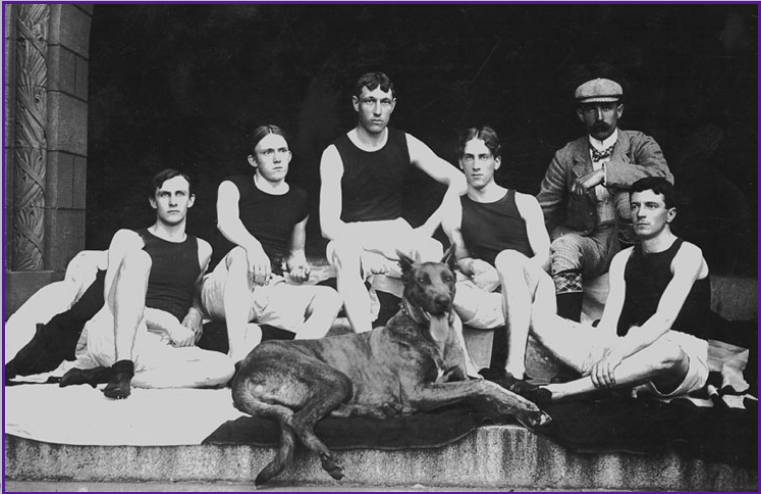 It is the Penn Relays team from 1900. This entry was posted in HIST204-Archive by einbende. Bookmark the permalink. Your decision to narrow the focus of your paper to a specific time period (1919-1941) rather than the history of Dickinson’s Athletic Department will help, as you said, with producing a more detailed and coherent paper. The meeting minutes you found in the Archives will help with understanding Dickinson’s perspective on the balance of education and the promotion of athletics. I think you will find information within the meeting minutes you would not otherwise find in official documents or pamphlets. I realize your paper is not intended to be a comparison of Dickinson’s Athletic Department with other colleges, but will you be looking at other colleges in our conference to see if Dickinson had a similar approach to athletics? Good luck on the rest of your paper!